As more people in Massachusetts take to the road on bicycles, the number of reported bike accidents has risen in recent years, and fatalities in Greater Boston’s suburbs have more than tripled. Collisions involving bicycles in the Greater Boston suburban area increased by 9 percent from 2010 to 2012, while statewide the number jumped 13 percent during the same three-year period, according to a Globe analysis of accident data provided by the Massachusetts Department of Transportation. Nearly 70 percent of the crashes resulted in injuries. The increase has come as biking’s popularity has soared, with state policy encouraging more people to ride and cities and towns adding more bike lanes to busy roads. “With the sheer number of bikes being ridden, there are going to be more accidents. It’s a statistical fact,” said Roy Mulcahy, a police lieutenant in Concord, a popular cycling town where riders are drawn to the rural and hilly roads. But David Watson, executive director of the Massachusetts Bicycle Coalition, said more steps should be taken to improve safety for cyclists. A look at collisions involving bicycles in the state. There were 12 fatal bicycle accidents in Greater Boston’s suburbs during the three-year period, jumping from two in 2010 to three in 2011 to seven in 2012. While half of those deaths took place in cities and towns south of Boston, bicycle collisions overall occurred in greater numbers north and west of Boston. Somerville, Lowell, Lynn and Newton each counted more than 100 crashes from 2010 to 2012; Brockton and Quincy finished with 79 and 61 crashes, respectively, during that time. The data analysis does not include the city of Boston, because police there do not report most crashes of any kind to the state. While the state does not count the number of bicycles on the road, 2012 US Census data revealed the number of bicycle commuters increased 75 percent between 2000 and 2012 to about 22,600 resident commuters. According to the 2012 US Census, bicycle commuters can be found in greater numbers in the communities surrounding Boston. While less than 1 percent of all Massachusetts workers commuted to work by bicycle, the communities of Somerville and Brookline saw 4.5 percent and 4.1 percent, respectively, of employed residents cycling to work. “More exposure generally leads to greater crashes,” said Josh Lehman, state bicycle and pedestrian coordinator for Massachusetts Department of Transportation, or MassDOT. As more riders have taken to the roads, and bike infrastructure has been added in recent years to protect bicyclists — such as bike lanes, cycle tracts and sharrows — it has made bikers feel safer in urban communities but has also created some confusion for drivers who may be unaware of cyclists’ rights, Lehman acknowledged. “People may be caught by surprise as a result of these kinds of changes on the ground,” he said. According to the crash data analyzed by the Globe, about two-thirds of bike accidents, or 66 percent, involved a passenger car. Other crashes involved everything from trucks to buses to mopeds. Also, bicyclists were most likely to be struck at an angle by a car, with 39 percent of reported accidents happening in this manner. In Greater Boston, only 5 percent of crashes involved a head-on collision and 10 percent of bicycles were sideswiped, or struck while moving in the same direction as the car. Other bike accidents involved “dooring” – or when a bicyclist struck an open car door. MassDOT takes the lead in promoting bike safety and educational training programs across the state. Its Safe Routes to School program offers educational materials targeted to students, parents, and community leaders in 557 elementary and middle schools across the state. MassDOT also works with the Registry of Motor Vehicles to include questions about the state bike law in the driver’s license exam. But bike advocates such as Watson believe drivers and bicyclists need much more education than the state offers. “I’d say not enough is being done to get the messages out really widely,” said Watson, whose coalition helps train kids for the Safe Routes to School program. Last year, he said, just 17 out of the 557 schools that signed up for the program had hands-on training on bike safety. “A culture change also starts with kids,” he said. In recent years, his organization has also helped rewrite the state’s bike law and train police and T bus drivers about the law. Earlier this year, MassDOT used a $461,851 federal grant to help train and educate police about the bike law in communities such as Somerville, Brockton, Newton, Lynn, Haverhill, Quincy, Salem, and Watertown. 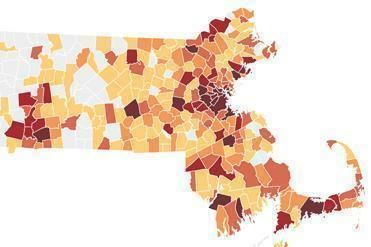 According to MassDOT, those cities were targeted because of their number of bike crashes. “Bicyclists, motorists, and pedestrians are confused about sharing the roads within our city. They also don’t know the laws of the road. 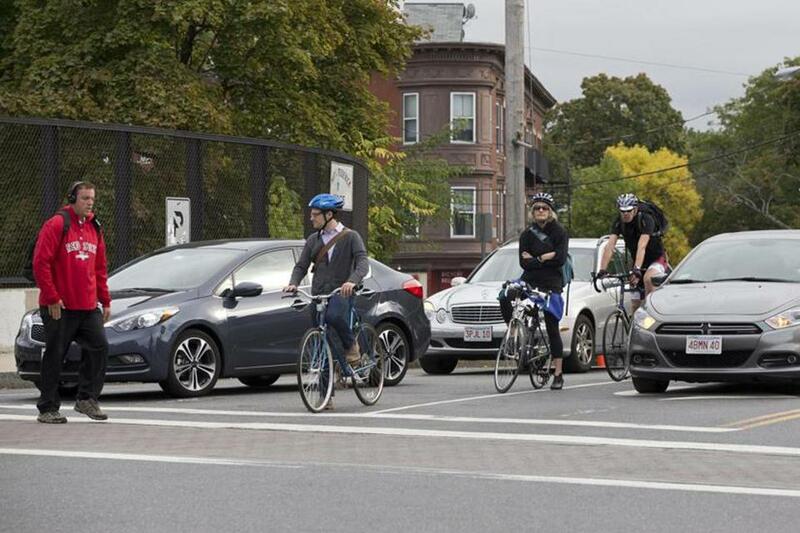 Further enforcement and education is needed,” said Somerville Deputy Police Chief Paul Trant, who added that police have set up patrols to monitor bikes and motorists at busy intersections, such as Somerville Avenue and Prospect Street. Since the training earlier this year, Somerville police have issued 200 $20 citations to bicyclists for road violations, such as running stop signs or traffic lights. Outside of the MassDOT educational programs, it falls to local communities to get the word out on bike safety to kids, motorists, and cyclists. The state’s bike law requires bicyclists to obey all traffic laws, use headlights and taillights while riding at night, and allows bike riders to pass cars on the right. Motorists and their passengers are required to check for bicyclists before opening their doors. Also, motorists are prohibited from making abrupt right turns at intersections and driveways after passing a cyclist. Some communities, such as Newton, have created bike safety committees, which have recommended inserting bike lanes in rebuilt roads, while other cities like Brockton have yet to create a formal bike policy. “The progress can’t happen fast enough,” said George Kirby, chairman of the Newton Bicycle/Pedestrian Task Force. The city is striping dedicated bike lanes on major roads such as Beacon Street, which is filled with commuters in the morning and late afternoon. In the meantime, some bicyclists like Paul Chenard — who recently started the Velo Urbano bike club in Brockton — are lobbying their own communities to build bike infrastructure, such as bike lanes, to improve safety. In Concord, police have set up a patrol downtown, where 26 of the 29 bicycle crashes occurred from 2010 to 2012. Those accidents earned Concord Center a spot as one of the more dangerous biking areas — giving the town a rate of 16 crashes for every 10,000 residents over the three years, the 13th highest rate in the state. Mulcahy, the Concord police lieutenant, said a combination of factors — such as the speed of the cyclists and the congestion caused by groups of cyclists riding together in the small downtown area next to cars — sometimes leads to accidents. Police have set up dedicated patrols to monitor bikes downtown, and have flagged bikers for running stop signs and riding through active crosswalks. Still, he said there’s no way to stop all accidents. Mulcahy said the department’s goal is to educate the public so accidents can be avoided. Catherine Cloutier analyzed Massachusetts Department of Transportation crash data for this report, and Steven A. Rosenberg researched and wrote the article. Rosenberg can be reached at srosenberg@globe.com. Follow him on Twitter @WriteRosenberg. Cloutier can be reached at catherine.cloutier@globe.com. Follow her on Twitter at @cmcloutier.